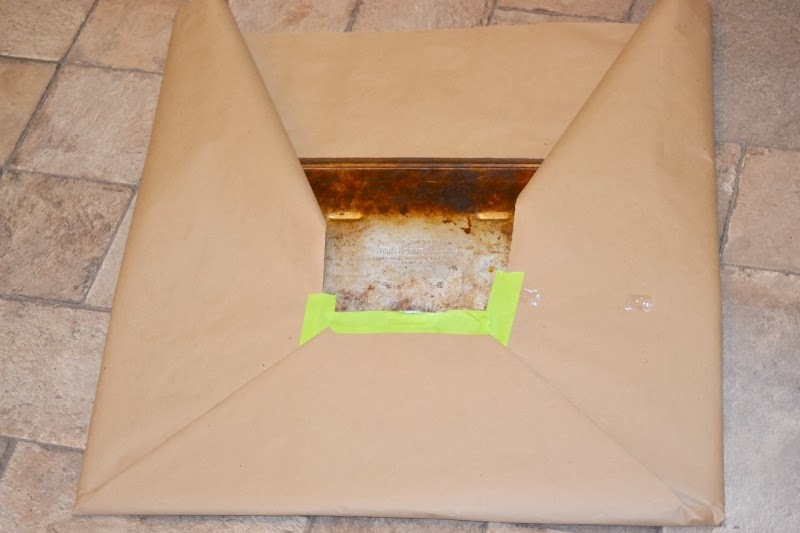 Since I was serving this at home, I covered one of my big cookie sheets with brown paper. If I was taking this somewhere for a party I would have scrounged around the recycle bin for a sheet of cardboard I could cover. I baked a boxed, chocolate cake mix, according to directions and made about 60 mini-cupcakes. 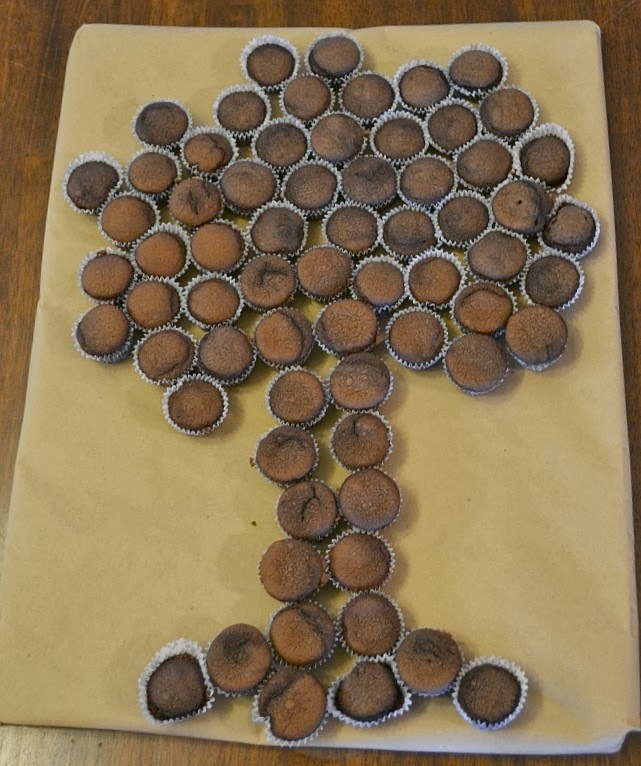 After they cooled I arranged them on my covered cookie sheet in the shape a tree. I then made up a batch of my homemade buttercream frosting. This stuff is so yummy. I would rather have great taste than have it look perfect and this frosting allows me to decorate simply and have an amazing taste. 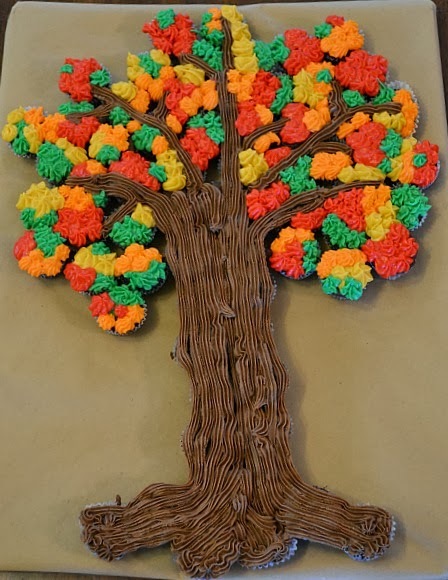 I divided up the frosting so I could tint it yellow, orange, red and green. 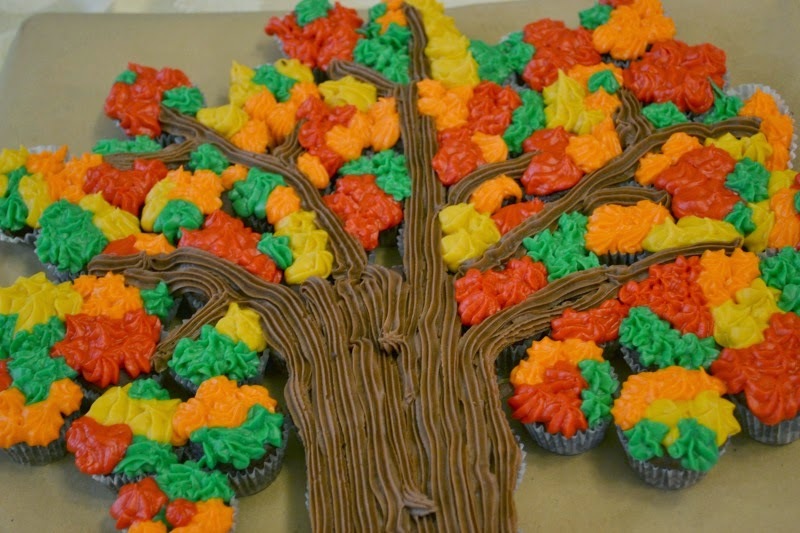 The rest I added cocoa to so I could have a yummy chocolate tree trunk. 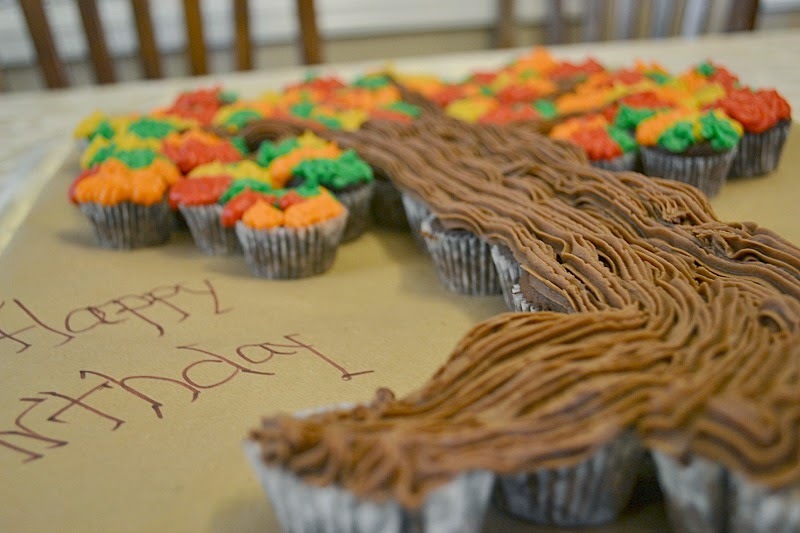 With a star tip I made long lines of chocolate frosting to make the tree and branches. The frosting will cover up the gaps in between the cupcakes. I love to decorate cakes, because there is always a lot of finger licking! 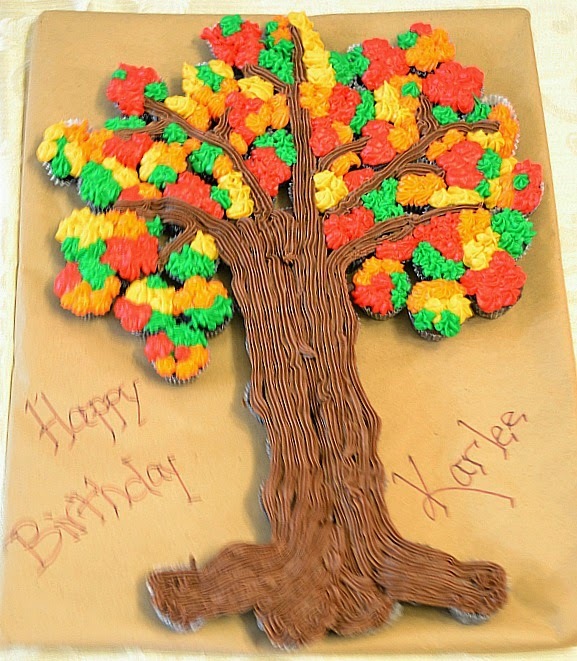 Then with my other colors, also using star tips, I made the colorful leaves. I would put a few red, fill some in with orange, add a little yellow and go back with a little green. I was fun to do, because it wasn’t hard, no set way to do it. I could really let the creative juices flow. I love the different textures of the tree trunk and the leaves. Because this was for a birthday, I simply wrote the message with a marker on the paper. But this would be great to use at any celebration this fall, or even as a Thanksgiving dessert. I love the mini-cupcakes because they are easy to just pop into your mouth. cute idea! It came out great! Oh, wow! That is so neat! I’m pinning this, for sure. Yay! This is such a clever and neat idea,Kalle. It turned out very cute and love the colors that you use here. Love this! I honestly would not have guessed those were cupcakes. Found you on the Organized31 party! I am your newest Twitter follower. Oh, wow, this looks just AMAZING! 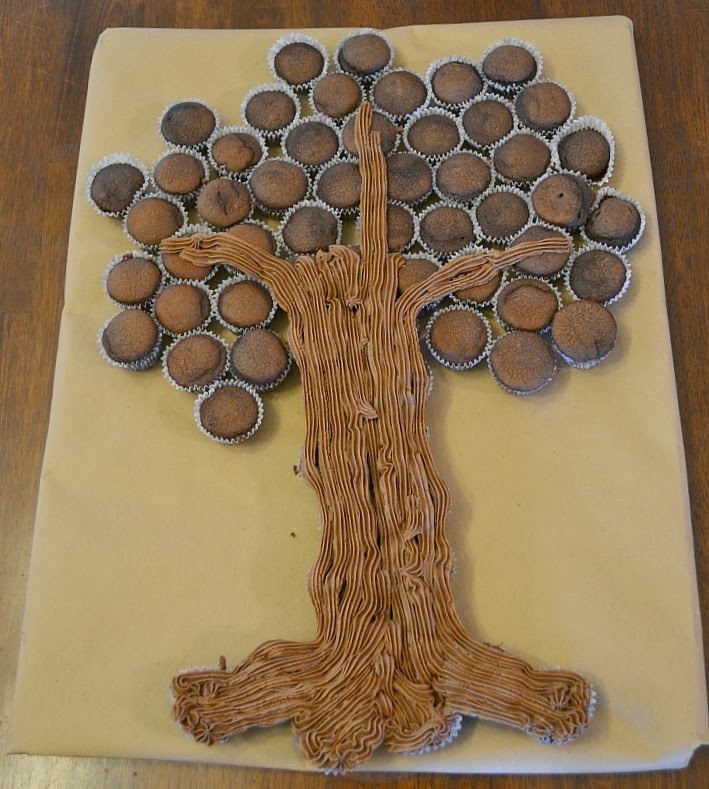 I thought at first that this was a craft, would have never imagined that it was a ‘cupcake’ cake! Wonderful! LOVE IT! I have a weakness for cupcakes too. So glad to be a fellow co-host with you at Foodies & Crafties Soiree. Can’t wait to see what else you post in the weeks to come! How cute!! 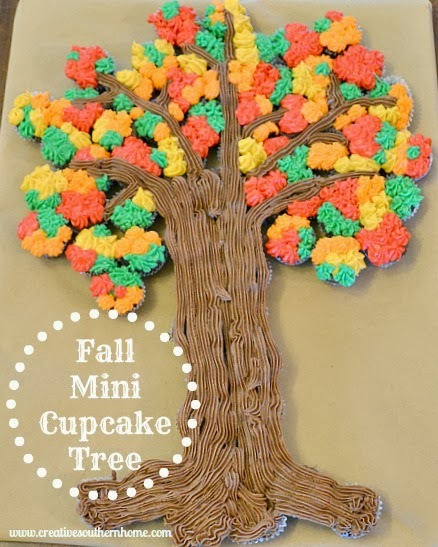 Never thought of using my mini cupcake to make these! Adorable. 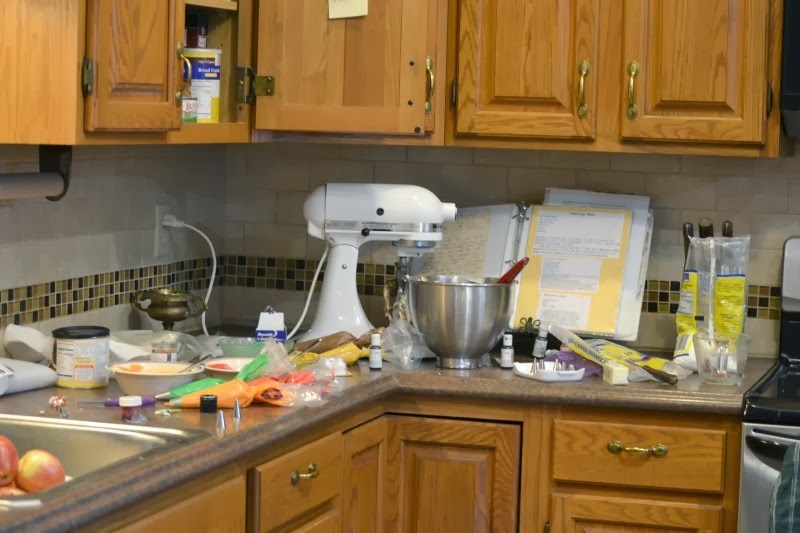 Thanks for linking up at Create it or Bake it hope you come back tomorrow and share again! Thanks for sharing on Foodie Friends Friday linky party! Congratulations…this post was featured on Create It Thursday #28! Thanks so much for sharing such a great idea last week! You have been featured at weekly creative… Thanks for linking up!